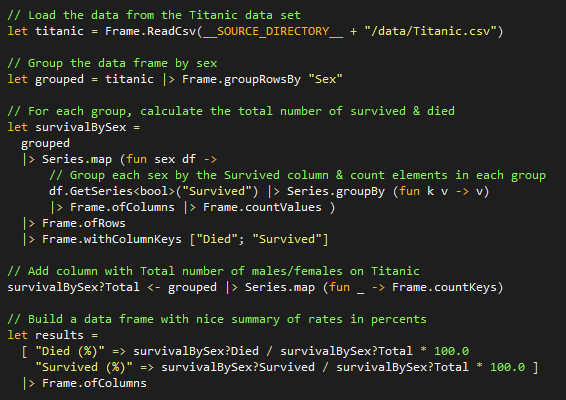 FSharp.Data 1.1.10 was released with a bunch of bugfixes. RProvider 1.0.1 was released with latest R.NET and RDotNet.FSharp inside. Francesco De Vittori works on type inference for Smalltalk. Immo Landwerth announced that “Immutable collections are now RC“. Visual Studio FSharp Team posted “Visual Studio 2013 RC and Send to FSI“. Sergey Tihon blogged “Stanford Word Segmenter is available on NuGet“. Phil Trelford wrote about “k-means clustering“. Valdis Iljuconoks posted “Matching the patterns“. Danny Tuppeny ‏blogged “Opt-in Nulls; an F# Feature Worth Switching For?“. Rachel Appel wrote “Understanding Your Language Choices for Developing Modern Apps“. brianberns posted “F# language warts“. Kapil Garg shared “FSharp -Top tweets (10/09/2013)“.